Volleyball clinched the A-10 regular season title Nov. 2 with a 3-0 victory over George Washington. But the Rams’ 13-game-winning streak ended Nov. 3 in a conference game versus George Mason — the Patriots swept the Black and Gold in straight sets. In the first set, VCU and George Mason went back and forth, trading leads as both sides grappled for initial control of the match. At one point, VCU trailed 15-10 before going on a scoring run to tie the set at 22-22. George Mason proceeded to win three out of the next four points, to win 25-23. For the second set, VCU came out fast and took an early 10-7 lead. The Patriots responded as the Rams surrendered four consecutive points, allowing George Mason to take the lead. Once again the teams sat tied at a score of 22-22. George Mason finished on a 4-1 run to take the set 26-24. In the third and final set it seemed VCU lost energy, allowing George Mason to separate and win the set 25-17. Middle blocker Tori Baldwin led the way for the Rams with 11 points. 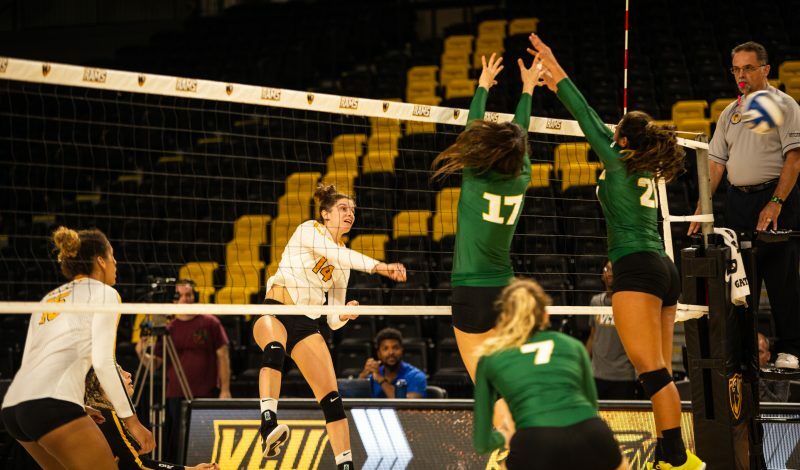 The 3-0 loss not only ended VCU’s win streak, it also gave the Black and Gold its first conference defeat on the season. In their first match of a two-game road trip, the Rams looked to extend their win streak to 13 games. They did just that in a dominant fashion against the George Washington Colonials. VCU came out explosive in the first set, and led 4-1 after five serves. Later on in the set VCU faced some adversity after surrendering its lead. Trailing 22-21, sophomore outside hitter Paula Neciporuka made two kills, leading the way to a 25-23 set win for VCU. In the second set, VCU once again had to go on a late run to take the win. They did just that with a 3-0 spurt to win the second set 26-24. A kill from junior middle blocker Jasmin Sneed, followed by a block and kill by Baldwin, led VCU to a set victory. VCU completely dominated the third set. The Rams quickly jumped out to a 20-10 lead over George Washington. With a comfortable lead, VCU coasted to a 25-14 set victory to close out the match. VCU final regular season match, and senior day, will be against Davidson Nov. 10. VCU will host the Atlantic-10 Conference Championship from Nov. 17-19.